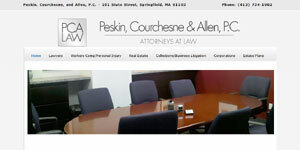 Peskin, Courchesne & Allen, P.C. is a comprehensive law firm experienced in several practice areas. Our lawyers specialize in the litigation and negotiation of Workers Compensation, Personal Injury and a variety of Tort Claims. Our real estate practice covers landlord tenant issues, purchases and sales, short sales, foreclosures, contract review and lease drafting. We also provide representation in commercial collections matters.